Hélène Cardona is the author of seven books, most recently the award-winning Dreaming My Animal Selves and Life in Suspension and the translations Birnam Wood (José Manuel Cardona), Beyond Elsewhere (Gabriel Arnou-Laujeac), winner of a Hemingway Grant, Ce que nous portons (Dorianne Laux), and Walt Whitman’s Civil War Writings for WhitmanWeb. She wrote her thesis on Henry James for her Masters in American Literature from the Sorbonne, taught at Hamilton College and Loyola Marymount University, and worked as an interpreter for the Canadian Embassy in Paris. She received fellowships from the Goethe-Institut and the Universidad Internacional de Andalucía. Her work has been translated into 16 languages. Acting credits include Chocolat, Star Trek: Discovery, Jurassic World, Happy Feet 2 and Serendipity among many. José Manuel Cardona was a poet from Ibiza, Spain. He is the author of El Vendimiador (Atzavara), Poemas a Circe (Adonais) and El Bosque de Birnam: Antología poética (Consell Insular d’Eivissa). He participated in the II Congreso de Poesía in Salamanca and belonged to the Cántico group. The Franco regime forced him into exile in France. He held PhDs in literature and humanities (University of Nancy) and political sciences (Graduate Institute of International Studies, Geneva), wrote his thesis on the Mexican revolution (Instituto de Cultura Hispánica de Madrid), and was an attorney (University of Barcelona). He worked for the United Nations most of his life, in Geneva, Paris, Rome, Vienna, Belgrade, Sofia, Kiev, Moscow, St. Petersburg, among many places. 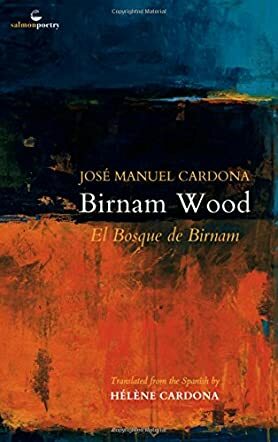 Birnam Wood by José Manuel Cardona is an elegant, epic, fecund odyssey of lyrical imagery, steeped in time-honored mythic tradition and yet endlessly inventive. Cardona is alternately stentorian and coy – his imagery swells like distant thunder even as it dances. In the truest Shakespearean tradition of using the oxymoron to forge new synaptic pathways, Cardona offers implacable, sublime juxtapositions of language which defy categorization. From Ode to a Young Mariner: "The sea is a bride with open arms/with stout rubber balls for breasts." This perfect union of seemingly unmarriageable images is closely followed by “Handsome men, hard as anchors torn/from the chests of a barbarian god.” This is the second sight of a true poet—a true master of incontrovertible word and image pairings which simultaneously sear and expand the brain. Birnam Wood is mind-expanding in the manner of the world’s finest literature—an epic adventure in verse, beckoning us to abandon all that we know for the promise a new way of seeing the world. José Manuel Cardona’s Birnam Wood is a paean to the importance of awe to human survival. With its roots firmly planted in classical mythology, Birnam Wood leaps into the air time and time again and absorbs itself thoroughly in the mystery of returning to earth. Birnam Wood is inexplicably suspended between mortality and immortality; groundedness and blind faith; past and future; courage and fear—it is a song for the ages, fascinating anew with every turn of an eclectic, sirenic page.